Toronto -- In 1984, Toyota’s revolutionary first Toyota 4Runner sport utility vehicle (SUV) was launched, combining the mechanics of the four-wheel-drive Toyota pickup truck with versatility and go-anywhere ability with comfort and utility. Twenty-five years and four generations later more than 103,225 Canadians have purchased the 4Runner and discovered both on- and off-road adventure. New for the 2010 Toyota 4Runner is an impressive list of new standard performance, safety, comfort, and convenience features, starting at an MSRP of $36,800 - the same starting price as the 2009 model it replaces. The all-new fifth-generation is redesigned inside and out to be even more rugged and athletic, delivering more power, better fuel efficiency and packed with more safety features and technologies for Canadian drivers in search of a confident, capable and authentic SUV. With a standard V6 engine featuring 270 hp, it offers 34 more horsepower and a five per cent improvement in fuel efficiency compared to the previous V6 engine. Moreover, the new V6 out powers even the previous generation V8 engine by 10 horsepower, and matches its 5,000 lb (2,268 kg) towing capacity. All the while new available technologies are sure to help tame Canadian weather and terrain from heavy snow to rocky trails, including Crawl Control and Kinetic Dynamic Suspension System (KDSS). 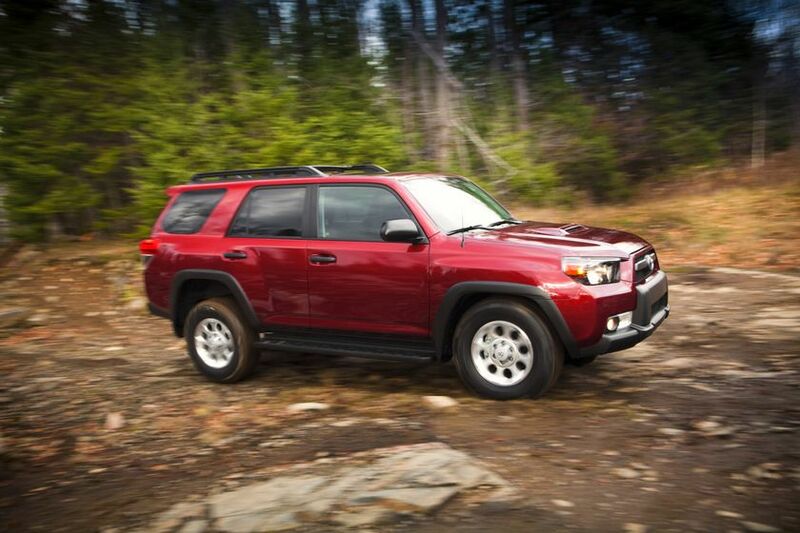 Power and fuel efficiency combined with new off-road technologies make the new 4Runner a true workhorse. 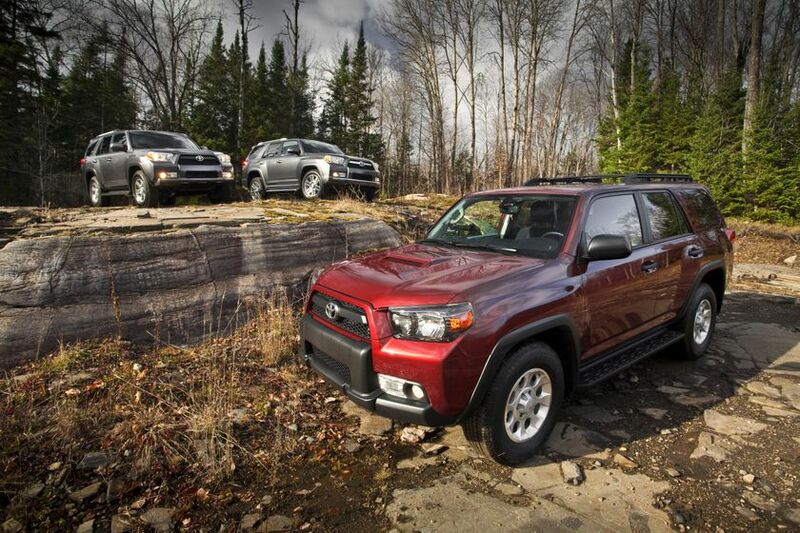 A perfect fit within Toyota’s mid-size SUV lineup, the 4Runner complements the Highlander crossover and the retro-inspired off-roader, the FJ Cruiser. It combines the toughness and durability of body-on-frame construction with multi-use design that excels at a wide variety of tasks. 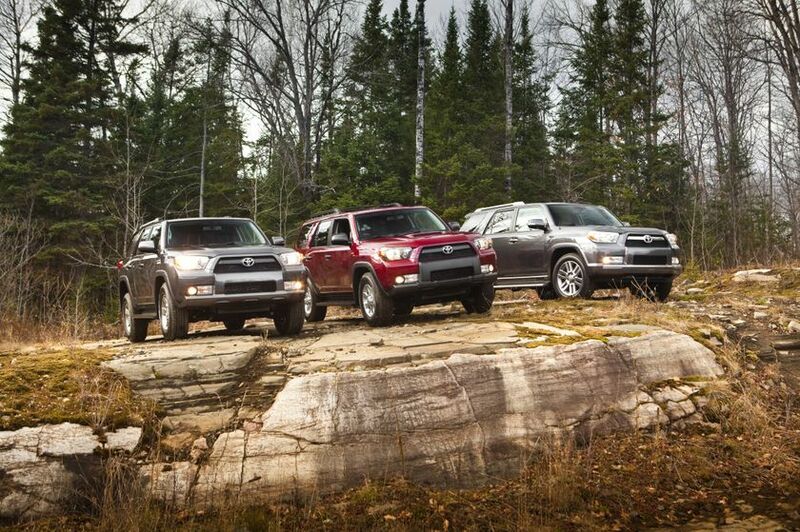 The newest 4Runner is taller, wider and longer for 2010, and is available in a variety of configurations. It will be offered in one well-equipped V6 SR5 base model with four option packages: the Upgrade package, the Trail Edition for those who require maximum off-road capability, the luxuriously appointed Limited package, and the top-of-the-line Limited with Navigation package. The standard drivetrain is a multi-mode 4x4 with a locking centre differential. All models are equipped with a 4.0-litre V6 mated to a five-speed Super ECT-i automatic transmission. Third-row seats in the Limited and Limited with Navigation packages allow for up to seven-person capacity. 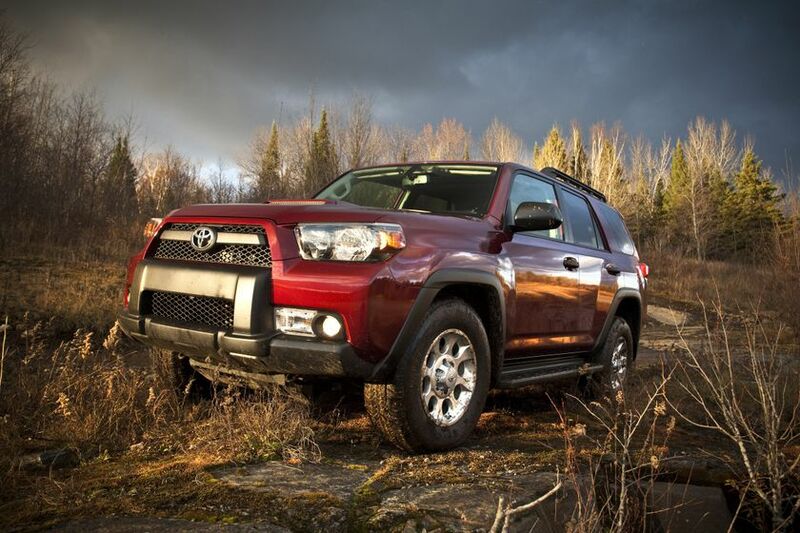 The 2010 Toyota 4Runner is on sale now at Toyota dealers across Canada starting at an MSRP of $36,800. Multi information display; and more. Smoked headlamp and tail lamp surround, and more. Auto headlamp system, and more. The design strategy builds upon the 4Runner’s heritage, emphasizing a more rugged, powerful stance. Large diameter wheels and tires were added to not only improve off-road performance, but also enhance the 4Runner’s truck-based characteristics. In addition to its styling emphasis on ruggedness and outdoor adventure, the new design utilizes a combination of Toyota’s classic boxy form and progressive styling. All 4Runner grades feature rugged new bumpers and wider shoulders, with newly designed headlamp and tail-light systems, which offer a newly-minted, technical design quality and better night time performance. The front end square fender flares meld with a muscular profile that links with a beefy and square rear bumper and back door. Aluminum alloy wheels are 17-inches in diameter on SR5 and Trail Edition and 20-inches on the Limited and Limited with Navigation Packages, and include a full size spare tire. In addition to its distinctive front grille, the SR5 grade also adopts overfenders and mud guards to help tackle inclement weather and off-road conditions. A roof-mounted spoiler comes standard for a more sporty appeal. The Trail Edition is designed to maximize off-road performance with a superior approach and departure angles, high ground clearance, and an array of functional upgrades for the most demanding active outdoor enthusiast. It can be distinguished by a unique hood scoop, unique 17-inch wheels, grille, black outer mirrors, front and rear bumper guards, chrome headlamps, and dark smoke treatment on the head and tail lamps. The Limited and Limited with Navigation packages feature integrated signal lamps and puddle lamps. The front end includes a chrome-plated front grille insert, fog lamp surround, and door handles. Fender flares are colour-keyed to distinguish both Limited Packages. 4Runner is available in six exterior colours. Three new colors, Shoreline Blue Pearl, Magnetic Gray Metallic and Classic Silver Metallic, join carryovers Blizzard Pearl, Salsa Red Pearl and Black. 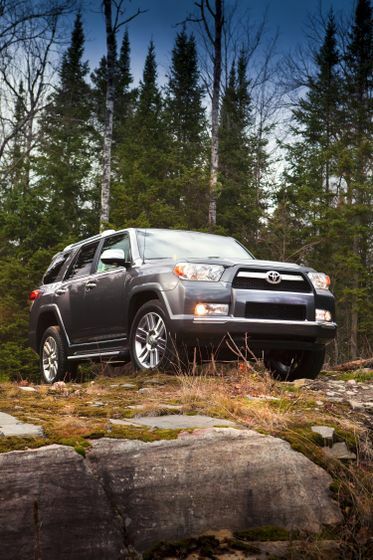 The 2010 4Runner is powered by a new 4.0-litre V6, which now generates 270 horsepower and 278 lb-ft of torque. Through the use of advanced engine management that includes dual independent Variable Valve Timing with intelligence (VVT-i), the new 4.0-litre engine offers the best of both worlds, adding more power while improving fuel efficiency. For 2010, the new V6 engine produces 34 horsepower more than the prior V6. Additional mileage improvements have come from careful attention to wind flow, reducing aerodynamic drag to a Cd of 0.365. Estimated mileage improves from 13.4 L/100km in the city and 9.9 L/100km on the highway to 12.6L/100km city / 9.2L/100km highway for all models. Both achieve an estimated 11.1 L/100km combined, an improvement of more than five percent. With the new 4.0-litre engine, maximum towing capacity is 5,000 pounds (2,268 kg). To build on its tradition of rugged body-on-frame construction, the newest 4Runner shares a similar platform as the FJ Cruiser. Extensive frame and body reinforcements have been added, using high-tensile materials to add strength without adding weight. All packages have are equipped with full-time, four-wheel-drive with a locking centre differential and employs a three-mode, centre console-mounted switch. The new 4Runner is also equipped with a stronger rear differential over the previous model, thanks to a ring gear that has increased in size from 7.87 (199.9 mm) to 8.18 inches (207.8 mm). To enhance grip, the A-TRAC system is now standard equipment on all models. The system can distribute driving force to any one wheel in contact with the ground, making terrain irregularities and slippery patches transparent to the driver. An electronic-locking rear differential is standard on the Trail Edition. An array of advanced features further boosts off-highway capabilities. The Trail Edition features Toyota’s Kinetic Dynamic Suspension System (KDSS). KDSS radically improves terrain-following ability by disconnecting stabilizer bars to allow for more axle travel, and better suspension articulation in slow, difficult terrain. Toyota’s Crawl Control (CRAWL) feature is standard on the Trail Edition. CRAWL is an adjustable electro-mechanical system that can be tuned to match the terrain by selecting any of five speed levels. The system maintains an appropriate speed that keeps the vehicle under control and minimizes the load on drivetrain and suspension components. The CRAWL feature helps make traversing difficult terrain easier and safer. With the transfer case shifted into low range, Crawl Control regulates engine speed and output (along with braking force), to propel the vehicle forward or in reverse at one of the five low-speed settings. This allows the driver to maintain focus while steering over very rough level ground or steep grades, without having to also modulate the throttle, brake or pedals. The Trail Edition also features a Multi-Terrain Select system which allows the 4x4 operator to dial in wheel slip control to match the terrain. In loose terrain such as mud and sand, more-than-normal wheel slip is permitted, allowing wheel-spin to work in the vehicle’s favour. On bumpy moguls, or solid rock, wheel slip is minimized and the system acts more like a limited slip. The Mogul setting is for any extremely uneven terrain, such as V-ditches, slopes, and ridges, uphill or down. All 4Runner models are standard-equipped with Downhill Assist Control (DAC), which is designed to augment the low-speed ascending ability of low-range by holding the vehicle to a target speed with no driver intervention. All 4Runner models come standard with Hill-start Assist Control (HAC), which provides additional control for off-road driving by helping to keep the vehicle stationary while starting on a steep incline or slippery surface. The new 4Runner may be a truck-based SUV, but it offers the kind of drivability and riding comfort more often associated with car-based platforms. Coil springs over gas shocks are used at all four corners for a comfortable ride and controlled handling. A double-wishbone independent front suspension, combined with new, variable-flow rack and pinion steering, makes for precise control on demanding roadways. The four-link rear suspension minimizes rear axle hop and assures a smooth ride for back seat passengers. The Limited and Limited with Navigation packages come standard with an X-REAS suspension system that further improves performance, comfort and control. X-REAS automatically adjusts the damping force of shocks when driving over bumpy surfaces, or when cornering. The system uses a center control absorber to cross-link shocks on opposite corners of the vehicle, substantially reducing pitch and yaw by offsetting opposing inputs. With X-REAS the new 4Runner corners flatter, smoother, and handles choppy pavement more easily. On-road vehicle dynamics are further enhanced by a suite of high-performance, state-of-the-art safety systems. Vehicle Stability Control (VSC) with Traction Control (TRAC), an Anti-Lock Brake System (ABS) with Electronic Brake-force Distribution (EBD) and Brake Assist (BA) are standard on all 4Runner models. Vehicle Stability Control (VSC) helps to ensure stability by compensating for oversteer or understeer. The system uses selective braking and modulated engine output to keep the vehicle in line with the driver’s intended course. The four-wheel ABS with EBD provides the 4Runner anti-lock stopping control with optimal brake proportioning, whether the vehicle is loaded or unloaded. Hill-start Assist Control (HAC), standard on all models, suppresses backward roll when switching from brake to accelerator. All 2010 4Runners have active headrests for driver and passenger, three-point seat belts for all seats, an energy-absorbing body structure and an energy-absorbing hood to help protect pedestrians. A system of eight standard airbags includes front, side-mounted and knee airbags for the driver and front passenger, and side curtain airbags for the second and third row. An auto-dimming rear view mirror with integrated back-up camera is available on Upgrade, Trail Edition and Limited packages. The system display is located in the rear-view mirror, helping to keep track of hard-to-see objects to the rear of the vehicle. For the Limited with Navigation package, the back-up monitor is integrated into the Navigation display screen. Both features make trailer hook-up much easier. The all-new 4Runner has been thoughtfully equipped with features and systems to create a comfortable travel space, allowing for convenient operation in everyday use. The larger interior has been completely redesigned with comfort and utility in mind. The front seats have a greater range of adjustment, both vertically and front to rear. A bright, highly visible dash houses speedometer, tachometer, voltage, fuel and temp gauges, plus a combination meter that offers multiple functions. An ECO Drive Monitor and fuel efficiency monitor allow the driver to manage fuel consumption in real time. Within easy reach of the driver is an overhead console that organizes the off-road control switches into one location. Features like a compass indicator and outside temperature display add functionality in outdoor settings. A manual climate control air conditioning system is standard on SR5 base and Trail Edition. An automatic dual zone climate control air conditioning system is standard on the Limited and Limited with Navigation package. The system features driver and passenger independent temperature controls, providing separate comfort levels. For second-row passengers, a newly sculpted front seat-back shape provides additional knee space. A centre armrest has been added, and the second-row seats now individually recline up to 16 degrees in four steps. Third-row seating has been enhanced with a larger, more supportive seating area. Access to the third row has been improved by splitting the second-row seats into a 40/20/40 configuration and adopting a one-touch walk-in function. A rich leather interior and heated front seats are standard on the Upgrade, Limited and Limited with Navigation packages. The interior sports newly designed interior colour schemes, using Black (Limited and Limited with Navigation only), and Graphite. Graphite fabric is standard on SR5 base and Trail Edition. Water-resistant fabric seats are standard equipment on the Trail Edition Package. 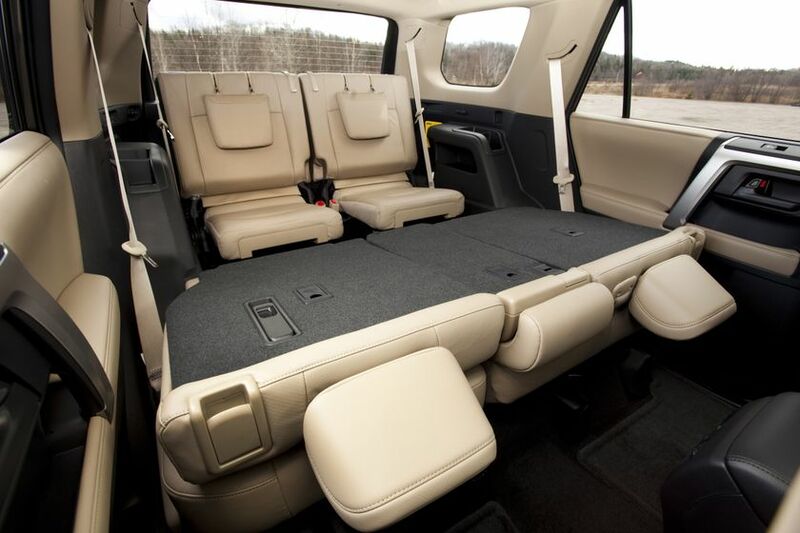 The cargo area has been re-engineered to be more versatile than any SUV on the market. More cargo space is available due to the fold-flat second-row rear seats, which do not require removal of the headrest for rearrangement. For models with three rows of seats, the third row seats are split 50/50, and they readily fold flat to allow the seatback to become the floor of the luggage compartment. They can be folded from the side, or at the rear, using separate one-touch mechanisms. With this new arrangement, more cargo space is available without removing seats, and longer items can be conveniently stored. A Smart Key System featuring keyless entry with push-button start is standard on the Limited and Limited with Navigation packages. The system allows the driver to unlock or start the vehicle by carrying the keyless remote. The back door window has jam control, like the moonroof and power side windows. The rear window features unique up/down capability. Another convenience feature is an available pull-out cargo deck that is capable of carrying up to 440 pounds of weight. 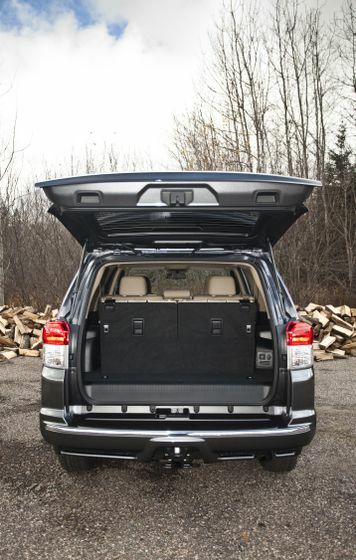 The cargo deck is offered on the Trail Edition and slides out to make loading heavy items easier. When extended, the sturdy cargo deck can also be used to provide seating, sheltered by the hatch, for tailgating and campsite relaxation. For models with the sliding deck, a 6.4-litre capacity storage box has been installed behind the rear seat, for handy storage of tools or other items. The SR5 base audio system has an AM/FM/CD player with eight speakers, providing quality sound throughout the cabin and is XM Satellite Radio capable. Standard audio on the Upgrade and Trail Edition packages is an AM/FM/MP3 CD player with eight speakers, integrated XM Satellite Radio (includes 6 months trial subscription), USB port with iPod connectivity, Bluetooth capability, and steering wheel audio controls. The Premium JBL audio system is available in the Limited and Limited with Navigation packages, it features a six-disc in-dash CD changer and 15 speakers for outstanding audio performance. For the Limited with Navigation package, a four-disc CD changer is used, and XM Satellite real-time traffic capability, Bluetooth capability, and iPod with MP3 control functions are included, with 15-speaker JBL audio. The navigation system includes a large seven-inch monitor. A “party mode” setting is standard on all packages and raises the bass and transfers the equalization to the rear of the vehicle to provide excellent outside audio for tailgating. Party mode benefits from rear hatch-mounted speakers and is actuated by a switch, installed in the instrument panel to the right of the driver’s seat (rear hatch speakers function with, or without, party mode).